Epoch Life Science's GenCarrier TM transfection reagents apply a proprietary Lipoplex-enhancing mechanism to obtain the best transfection outcome - highest transgene expression and lowest cytotoxicity. Epoch Life Science is determined to maintain the highest standards and deliver the highest quality products and services. Every batch is strictly tested to meet the requirements of cell-culture grade bioproducts. GenCarrier-1TM has been used successfully to transfect DNA into HeLa, CHO-K1, COS, LNCaP, NIH3T3, U937, SF-9, S2 (Schneider - Drosophila), 293, T-24, C2C12, PANC-1, primary human keratinocytes, primary aortic smooth muscle, primary rabbit myoblasts, human bone marrow endothelial cells (HBMEC), and other cell lines. No significant toxicity was observed at working concentrations on the cell lines tested. Enough reagent is provided for approximately 250 transfections in 35-mm plates per package. GenCarrier-2TM has been used successfully to transfect DNA into COS, HepG2, PC12, NIH3T3, Jurkat, PC-12, HUVEC, primary human pancreatic islet cells, primary rat and hamster hepatocytes, primary rat cardiomyocytes, primary male rat germ cells, primary chick retinal neurons, primary rat fibroblasts, primary human keratinocytes, and tracheobroncial cells. No significant toxicity was observed at working concentrations on the cell lines tested. 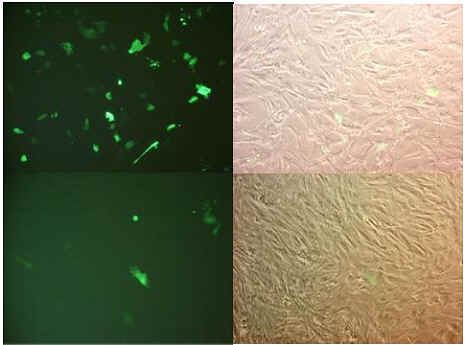 RNAiCarrierTM has been used successfully to transfect siRNA into HEK293, HuH-7 (human hepatoma), B16 melanoma, CHO-K1, COS-1, COS-7, NIH3T3, SF-9, S2, primary human keratinocytes, primary rat aortic smooth muscle (WKY3M), and other cell lines. No significant toxicity was observed at working concentrations used on the cell lines tested.